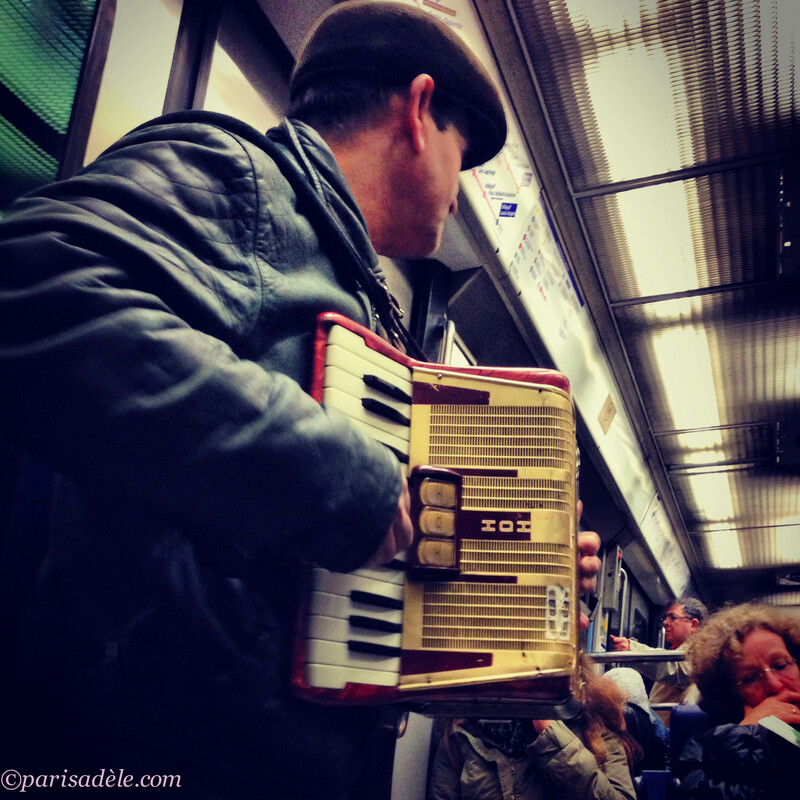 It is possible that riding the Paris Metro could form part of an indelible collection of memories and some of the fondest souvenirs that you will take home from Paris. 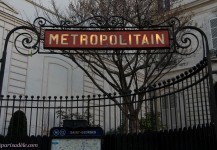 The Paris Métropolitain, fondly known as the Métro, is often considered merely a way of getting around the city of Paris, however there are few delights to be savoured along the way. Riding the métro, you may find lone buskers belting out La Vie en Rose, between stations, passing around a hopeful plastic cup for a couple of centimes in exchange for their entertainment. In the stations, especially at Châtelet, you may come across large 10 piece big bands, taking advantage of the underground acoustics. The homeless often take shelter from the outside elements on the benches as commuters sprint down the long tunnels, adorned with white bevelled tiles, commonly known as ‘métro tiles’. 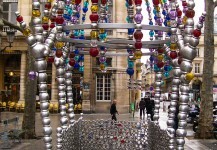 Apart from the daily activities that take place along the long corridors, there are a few notable Paris Métro stations that offer rare and unique decorative entrances. 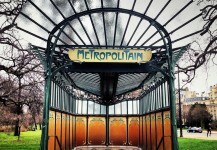 The original iconic Art Nouveau entrances designed by Hector Guimard, with twisted iron and glass canopies are nothing short of spectacular. 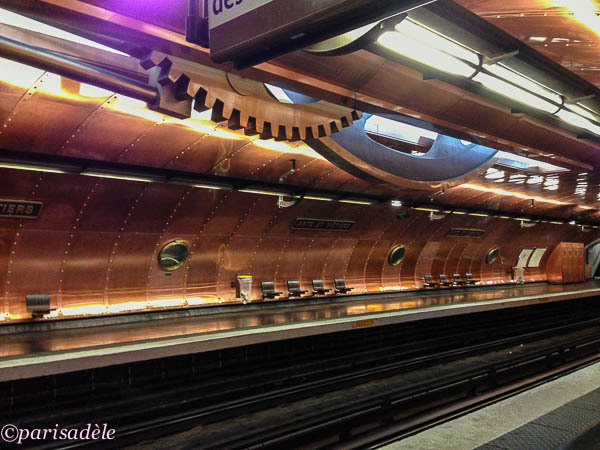 The shiny copper platform, designed by François Schuiten, only to be found on the platform that serves line 11 at Arts et Métiers, is a homage to Jules Verne’s epic, 20,000 Leagues Under the Sea. 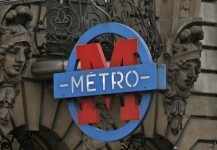 The Paris Métropolitain serves as a huge history lesson. Stations named after historic battles, events, activities, monuments, famous writers, poets and politicians. Here are a few interesting and unique Metro Stations and entrances that I think are worthy of a mention. We must be long, lost sisters, as I too have a fascination with Metro art and have this on my list of must-sees for my next trip. Do you know of a map that highlights all the unusual Metro stations/art? I’d like to plan my route ahead of time if possible. ha ha – As Seen by Susan maybe we are – glad you found it useful. I don’t know of a map, I just made one up myself but that is a good idea. I will get one made up for you before you leave for Paris, you go in May is that right? If I start you at Hotel de Ville, will that be suitable? Actually, I am in the process of mapping out the Metro stations with my own Paris map. 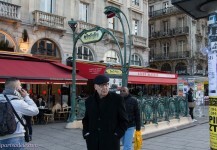 We found a place to stay right near Place de Republique, and I have marked all the places I want to see. I think I have it figured out, and the Metro system itself is pretty easy to use. So I’m confident that I won’t get lost. But another question. Isn’t there a Ferris wheel at the end of the Tuileries near the Louvre? Or am I mistaken? Thanks for your help! Hi Susan, it sounds like you have everything under control. I highly recommend the free metro app (there is a link under practical information on my blog), it can work without data, so doesn’t use any phone credit. You type in the station you are starting from and where you want to go and it works out the route for you. Takes a bit of stress out of working it all out. The Grand Roue, the ferris wheel you ask about is installed in Place de la Concorde at the gates of the Tuileries but it is only there from mid November through to mid February, so I think that you will miss it, unless they have changed the dates but it isn’t a permanent fixture.